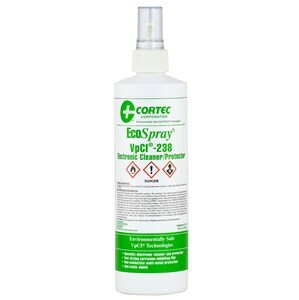 Cortec ECO Spray 238 Electronic Cleaner is an excellent contact cleaner of oils, grime, salt deposits and other contaminants. The cleaner leaves behind Cortec VpCI corrosion protection; displaces moisture while leaving electrical resistance intact. Multimetal protection. Silicone-free. 16 fl. oz. pump spray.